NESCIENCE is currently running until July 26 at Light Square Gallery, TAFESA. South Australian artist Ellie Kammer has captured her experience with the crippling and debilitating disease known as Endometriosis that affects up to one in ten women in her latest exhibition NESCIENCE. Endometriosis remains misunderstood, and unrecognised as a significant illness, with many women advised by medical professionals that their symptoms are normal, or in their head. This stigma results in the affected suffering in silence, greatly impacting their ability to do everyday tasks and taking away from their overall quality of life. Kammer’s series of confronting large-scale paintings are a snapshot of the inner suffering and pain that is externalised through the harsh cuts and open bleeding wounds that immediately take the viewer aback. Because Endometriosis is invisible and only diagnosed through an intrusive medical procedure known as a laparoscopy, women continue to live undiagnosed. 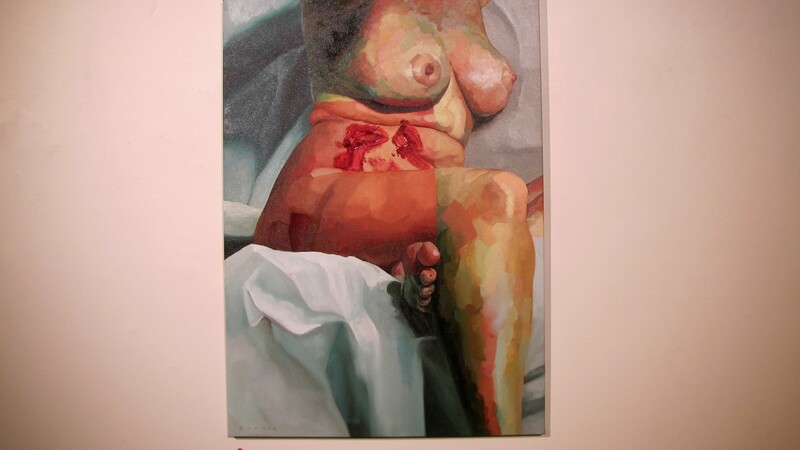 However, Kammer attempts to bring it all to light, portraying the everyday Endometriosis sufferer in a realistic way. Bare naked bodies comprise the canvases and contrast the idea of perfection that’s usually depicted nowadays. Their skin, breasts, thighs and veins are there for all to take in, interrupted by the deep fleshy cuts along the stomach that provoke thought and conversation, long after exiting the gallery. Kammer uses oil paints to achieve that rich and textured balance throughout her pieces that become almost three-dimensional in their own right. They’re no longer just a painting hanging against a white wall, but a sculptural reflection of sufferers around the world. The viscous smears of vivid red hues serve as a reminder of the harsh reality that they face on a daily basis. Alongside these striking works, Kammer transports us into her own world, with two self-portraits that communicate a silent but loud pain. 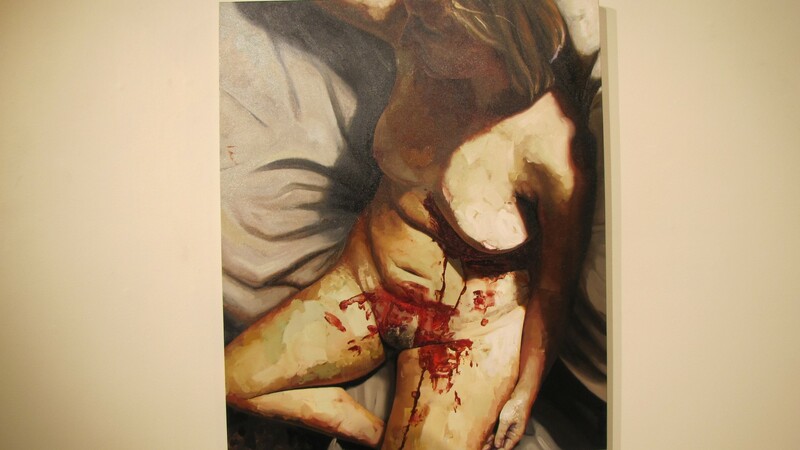 Her raw and vulnerable body is exposed for all to see – without the dabs and smears like the other paintings. However, her stiff expression and fragile lifeless body looks somewhat composed, like she’s screaming on the inside, trying to find a moment of peace through the suffering. The Adelaidian were fortunate to learn more about Kammer’s journey with Endometriosis and her motivation behind NESCIENCE. Georgina: What motivated you to create this series? Ellie: I’ve always been interested in painting, in fact I’ve always considered it an alternative to typical language. It’s an opportunity to tell a story and raise a question. This series of paintings was born out of frustration over the general lack of conversation and education about endometriosis. I didn’t like the stigma attached to the disease (it’s just women’s period problems) and I felt that I had a responsibility to illustrate the severity of the disease and the many ways it affects a host’s life. Georgina: How do you feel capturing the attention of people worldwide with your art work based on a realistic chronic illness? Ellie: I think I’ve achieved what I initially set out to do. I’ve married my technical abilities with an important message and I think I’ve created a strong body of work as a result. I’m quite overwhelmed by the public response to this series – I sort of expected a lot of backlash and argument due to the controversial nature of the images but I’ve mostly been met with love and support. I’ve reached more people than I could have ever imagined as I’m a young artist with a very young career. I’m so grateful for the support and it it’s encouraging to experience the pay offs of dedication and perseverance. One day it hit me that I didn’t have to let the disease ruin my life and I mentally conceptualised an image that would free me of some of the emotions that were rotting inside me. I quickly took the steps needed to realise the painting and the process was so rewarding. Georgina: Can you tell us a little bit about your background? Ellie: I started channeling emotion into artwork when I was fifteen or sixteen. I was living in an abusive environment that had me stripped of basic human rights. I felt trapped, isolated and dangerously depressed. My reaction to my situation was to draw all day every day and I discovered it was a powerful tool for keeping me mentally stable. I figured out that I wanted to pursue a career in the arts when I was 21 and I started making a series of drawings and exhibited them locally. I began to make connections with other local artists and eventually I met Robin Eley. In 2013 I began private painting lessons with Robin at his Adelaide studio and from there I dedicated every spare moment to practicing painting, researching, watching documentaries, enrolling in online academies. I did everything I could to learn what I wanted to know. After two years of solid practice and research I felt that I had a good understanding of painting, I just didn’t really know yet what I wanted to discuss with my work. In December of 2015 I was diagnosed with Endometriosis which shifted every part of my life. I had trouble adapting and consequently I receded into a pretty dark corner of my mind. One day it hit me that I didn’t have to let the disease ruin my life and I mentally conceptualised an image that would free me of some of the emotions that were rotting inside me. I quickly took the steps needed to realise the painting and the process was so rewarding. I decided that this is the approach to painting that I needed to adopt and practice from then on. Georgina: What’s next for you? Ellie: I intend to create more works on a similar tangent. I’d like to discuss my own experiences with endometriosis and adenomyosis with a greater focus on the mental anguish that comes with chronic illness. Once I’ve explored this idea with a couple of paintings I’ll be seeking gallery representation and I’d like to devote some time to entering national competitions too. Georgina: What do you hope Australians can learn from your exhibition, and if more people raised awareness of chronic illness? Ellie: I hope that the work in my current exhibition inspires acceptance of differences in people. I have spoken out about what has come my way and though it’s sometimes scary to be so vulnerable, it’s healthy and rewarding to express oneself. I think we all just want to relate to each other and be understood and the key to this is openness.